Red Dead Redemption GOTY Edition Announced and Myths and Mavericks has been released! 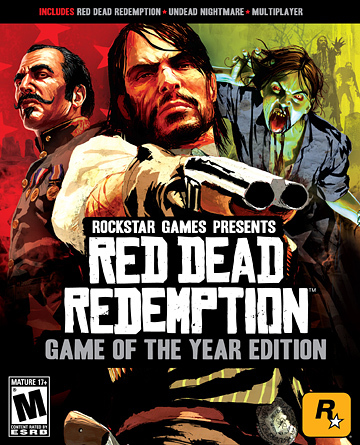 On October 14th, Rockstar Games will be releasing a Game of the Year Edition of their western hit which will include the original game as well as the Undead Nightmare pack will all of the current DLC available. The pack will also include all of the pre-order bonues, as well as today's free Myths and Mavericks pack. "The Myths and Mavericks Bonus Pack offers another expansion to the world of Red Dead Redemption multiplayer. Battle your enemies in 11 new map areas including the snowy mountains of Cochinay, the army stronghold of El Presidio and the mining camp in Gaptooth Breach. Play as additional multiplayer characters from the single-player story: Landon Ricketts, Drew MacFarlane, Uncle, Javier Escuella, Captain Vincente De Santa, Deputy Eli, Deputy Jonah and Nastas. Also works with the standalone Undead Nightmare disc."